Thunderstorms and flash-flooding have brought parts of south-east England to a standstill as the region received a month's worth of rain in a few hours. Kent Fire and Rescue Service warned motorists to drive only "if necessary" after a lunchtime deluge left parts of the county impassable. London Fire Brigade also confirmed that it received more than 100 flood-related calls on Tuesday. Some train services were cancelled as railway lines were submerged. And some flights from Gatwick Airport were also cancelled or delayed by "adverse weather". Almost the entire May average of 50mm (2in) of rain fell in the region in just a few hours. Kent Highways had received around 280 calls related to flooding by 15:30 BST. A spokesman said: "We have had more calls in the past few hours than we normally get in two weeks." The worst problems were in Maidstone, Gravesham and Swale, in the north-east of the county. Stretches of the M2 - a key route from London towards the Kent coast - were closed for a while as emergency services and Highways England cleared flood water from the carriageways. The A249, which links the M2 and M20, was closed both ways and other routes were also badly flooded. London was also badly hit with about 30 houses flooded by up to 25in (64cm) of water in Erith, south-east London. Four people were also rescued from their cars in Stratford, in the east of the city. Two fires in north and west London, believed to have been caused by lightning, were among more than 100 calls the fire service received during the day. BBC weather presenter Nina Ridge said the worst of the storms were believed to have passed, but she warned there was still more heavy rain on the way. "The Met Office yellow weather warning is in place until 06:00 on Wednesday, although that is likely to be extended," she said. "Through the night we don't think it will be as bad, but there could still be heavy thundery downpours in the morning and for the next few days." 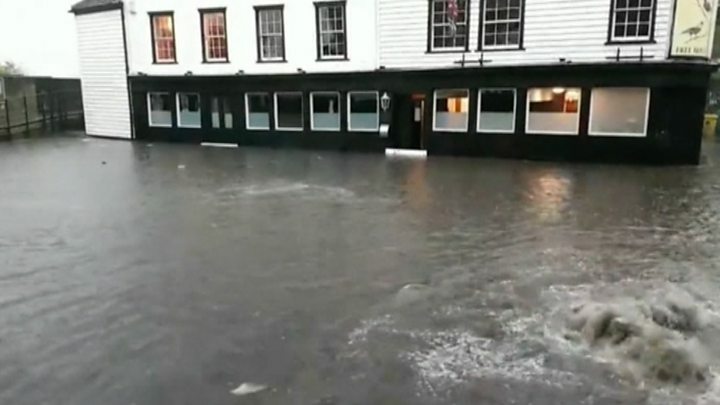 The Three Daws riverside pub at Gravesend was hit for the second time in three days, forcing it to close at lunchtime. Manager Lisa Bishop said the pub's flood defences were breached for the first time since they were introduced a few years ago. She said: "They are just under 1m high but the water went over them. My cellar is still under water and I'm waiting for Southern Water to bring a pump to pump it out. "At least 20 barrels of beer are bobbing about. I have had to rip my carpet out in the function room on the first floor." She said the flooding had caused thousands of pounds worth of damage. In Chatham in Kent, Judith White and her budgie had to move out of her house after flooding. She said: "Being on my own and not in the best of health, it's very scary. The worst thing is I've no insurance."